Portland, Maine real estate is popular because this area offers a perfect balance of a hip attitude and humble roots. You’ll find a wonderful variety of single family homes, condos, and multi family homes in Portland. The residents are friendly, hardworking and genuine. Portland was first settled back in 1632 and has remained bustling seaport ever since, making it one of the oldest functioning port cities remaining in the United States. This rich coastal tradition permeates throughout the city and seamlessly blends with the modern, eclectic vibes coming from the art galleries, music venues, shopping centers, and award winning restaurants. 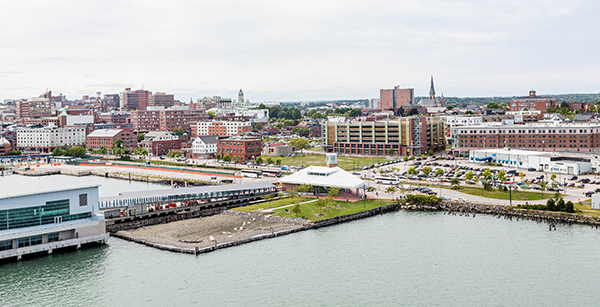 Learn more about Portland, Maine. Scroll down to view Portland, Maine real estate listings and don't hesitate to call us at 207-784-2525 or contact us online for more information or to schedule a private showing. Recently updated 3 bedroom, 1 bath Cape with fenced-in back yard! Extra storage with the workshop garage in the back. ***OPEN HOUSE Wednesday 4/24 5-7PM*** Million dollar views of the Portland skyline from multiple vantage points in this classic, well-built home perched above the Back Bay. Enjoy coffee and sunrise views from the master suite balcony, or evenings around the fireplace watching the moon set over the city. Open floor plan with large living room, dining room adjoining the kitchen and sun room--all lined with windows. Two bedrooms on the first floor with a full bath and a huge master suite on the second floor with two walk-in closets. Spectacular location as you can walk across your yard and run or walk a 5k around the Bay, or bike into downtown Portland. Fully renovated in 2001 and with solar efficiency to maximize the value of this sunny spot. Mature ornamental trees, well-manicured hedges and foundation plantings, an organic vegetable plot and literally hundreds of spring bulbs and perennials. Dubbed the 'House of Rock' by Curbed Magazine this is one of Portland's most memorable and remarkable homes. Come enjoy the very best of modern living in a near net zero home that compliments its surroundings yet stands alone. Attention has been paid to every detail, every refinement in a home that is curated and comfortable in the same magical moment. 3 bedrooms, 3.5 baths, elevator, garage.... The Location - ideal. The views - awe-inspiring. The experience - enchanting. The opportunity - once in a lifetime. ***OPEN HOUSE Saturday 4/20 11-1PM***Gorgeous end unit condo in the lovely Ocean Ridge neighborhood. Convenient to downtown Portland and the Portland trails. This lovely home features a spacious master suite with attractive built-ins, and spa style master bath. Enjoy natural sunlight throughout the home with multiple windows. Stainless steel appliances in the kitchen, along with a large kitchen island, make entertaining a breeze. Finished lower level space can be used as an office, den, or whatever you require as there is a full bathroom on that level as well! Entertain guests throughout the home, while enjoying the outdoors on the front and back decks. Dramatic views of Casco Bay, the islands, Munjoy Hill and the downtown await you from the top level of this elegant high-rise with a big-city feel to it. This tri-level condominium offers 1300 SF of sunny living space and includes a master bedroom suite, wood floors in the main living space and newer windows and kitchen appliances. Loaded with amenities, Promenade East offers covered parking, a swimming pool, a game/common room, professional management and the best views in Portland right outside your door. Walk to Munjoy Hill's many fine restaurants, the parks and trails of the Eastern Promenade, antique shops, brewpubs and Portland's downtown and Old Port areas. Easy access to RT 295. Don't miss out on this rare opportunity to live in one of Portland's iconic buildings! You will not want to leave when you visit this sunny, well maintained home tucked into the West End. This home embodies everything a West End home should, with a gorgeous chiseled banister and a marble mantel. The massive windows allow in the sun, drenching it with warmth. The tall ceilings and hardwood floors throughout enhance the grace and elegance. The front gardens create a beautiful pop of color increasing the curb appeal.1st floor offers 2 large living rooms, dine in kitchen. 2nd floor offers 3 bedrooms and a charming office, 3rd floor is finished and has a full bath. Have you always loved the idea of living in a cottage? This newly renovated 2 bed room home was reconstructed from the ground up under the watchful eye of a structural engineer. This in-town unicorn features a fenced in back yard with open space behind it, hard wood floors, high efficiency heat/ AC Pumps and too many other features to list. Enjoy the convenience of Portland living in this adorable 4 bedroom Cape, with views of Presumpscot river! Launch a kayak from your own back yard or enjoy evenings on the deck overlooking the water. The home has a desirable layout with 2 bedrooms on the first level, one currently being used as an office and a sizable family room with an eye catching chandelier and hardwood floors. There's a spacious eat-in kitchen with sliding glass doors leading to an open back yard retreat with room for a fire pit & hot tub. Upstairs is a spacious master bedroom and a fourth bedroom both with large closets. There's no shortage of storage with the extra space in the basement and the additional storage shed. Live close to all Portland amenities at an affordable price! No showings until the Twilight Open House Tuesday 04/23 4-6pm. Beautiful 3 bed, 2 bath secluded condo in convenient Washington Crossing! Featuring a kitchen with granite counters, tile back-splash, center island & dining area with access to back deck. As you move into the living room you will find meticulously maintained hardwood floors, a shiplap wall and a fireplace with built-ins surrounding! In addition to the first floor master en-suite, you will find a second floor en-suite and third bedroom/flex room! Entertain outdoors on a paver patio and private deck overlooking the wooded backyard! Convenient location; easy access to I-295,Portland trails, and minutes to downtown Portland! 1-car attached garage, pet-friendly association! Knight Farm - Portland's newest subdivision! Great location in North Deering off Washington Avenue Ext. Plan your dream home! Custom build packages available starting at $450,000.